Ester Sprood Cross - Pocol: walking through trees and rocks. 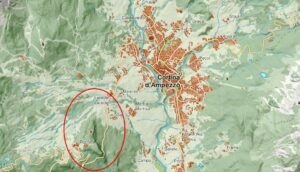 HomeHikes and Trekking Ra Cros de Ester Sprood – Pocol, a short circuit hike. What I am about to describe is a pleasant short walk which lots of people are not familiar with, a circuit just a short distance from the town and an opportunity to hike through an attractive environment of woods and rock faces, frome Ester Sprood’s cross to the Pocol Military Sacrarium. From Cortina to the Socrepes car park, the starting point. You can get here on foot (it’s just half an hour away from the town) or by bus from Cortina. From the top of the car park an asphalted lane moves southwards through the houses of Lacedel village and continues, on an uphill gravel road now, to Croš de Ester (Ester Sprood’s cross). This mule track (footpath 403) and the area it passes through is known in Ampezzo as ‘in pò Crepa’. Croš de Ester (or ‘de Šiora Ester’) reminds us of the tragic demise of Ester Victoria Sprood, English wife of Ampezzo shoemaker Antonio Constantini, who suddenly collapsed right here, struck down perhaps by lightning or perhaps by a heart attack (we don’t know which) on 8th August 1889 at the age of seventy three. But let’s get back to our walk from Ra Cros de Ester to the Military Sacrarium in Pocol. Just beyond the cross you will see waymarks on a tree to the left which tell us which path to take. Don’t worry too much about the phrase ‘for expert hikers’ here. 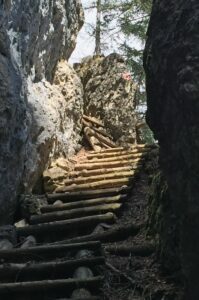 It is true that a short section of the path follows certain rocky overhangs but there are ladders there to help you over these and it is located in a rocky gully which is protected on both sides. It should, however, be noted that when it is rainy the trail can get slippery and dangerous and it might be best to walk elsewhere in such weather. Follow clear footpath no. 429 which soon turns into a narrow corridor next to a sheer rock face. Continue to the most characteristic section, a short wooden ladder which takes you easily across the rocks. At the end of this exposed section you get to a panoramic point offering magnificent views across the Ampezzo valley. The path continues through the woods before emerging suddenly at the foot of the Pocol Military Sacrarium. This monumental work was built in 1935 to designs by engineer Giovanni Raimondi and consists of a massive 48 metre high square tower with a two level base. The base encompasses the sacrarium itself containing the bones of Italian dead, both known and unknown (9707 Italian dead – 4455 unknown – 37 Austro-Hungarian soldiers) from the various war cemeteries in Cadore and Ampezzo. The sacrarium rises from Pocol and is easily visible from Cortina. Continue to the west side of the tower and along the access avenue before descending to Pocol. Here, before you reach the state road, a not very well marked gravel lane which begins behind the former Hotel Tofana, knocked down in 2004 and still being rebuilt (that’s Italy for you…), takes you back to Cros de Ester again. It is the ‘in pò Crepa’ road, the same gravel road you took uphill, just beyond the cross. From here you retrace your steps and soon get back to your car, thus completing this attractive circuit just a short distance away from Cortina. From the car park to the cross: approx. 15 minutes. From the cross to the Pocol sacrarium 15-20 minutes approx. From the sacrarium to the car park: approx. 30 minutes. 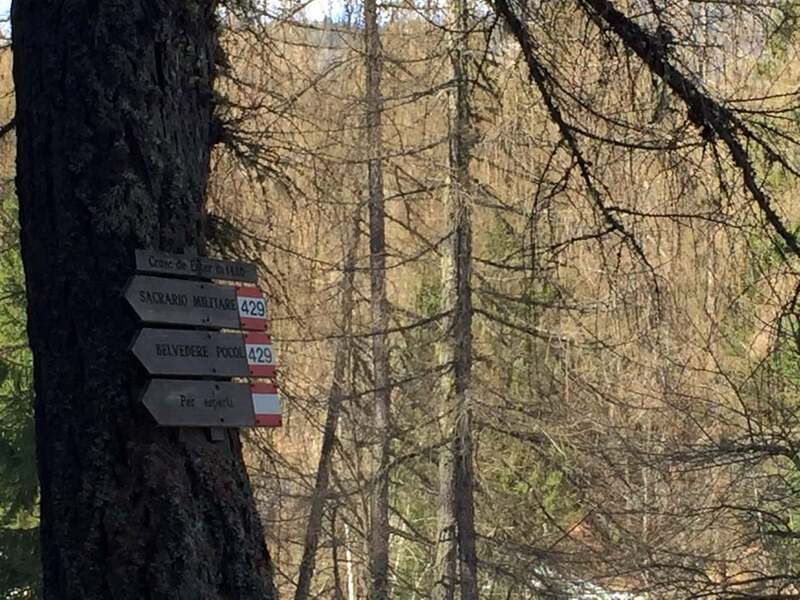 If you want to walk a little more, when you leave the sacrarium access road, rather than turning right and descending to Pocol turn left and you’ll get to the former upper cable car station from Cortina to Pocol. From here the views over the Ampezzo valley as you wander through the woods are excellent.